The MN HS League headed over the border into Wisconsin for race #5 at Whitetail Ridge on October 7th. With temps hovering between 40 and 50 degrees, over 700 mountain bike racers from MN, Western WI, SD, and ND converged at Whitetail Ridge, for the fifth of the seven-race series. A fan-favorite race venue for the league; racers were thrilled to be back at Whitetail Ridge to take on the 4-mile course of endless climbs and rolling hills. Throughout the day, horns, bells, and cheering could be heard coming deep from within the forest. As a wave of racers would head to the finish line, spectators would spill out of the forest and rush to the finish line and watch the racers cross the line. With racing taking place from 8 am until 4 pm, it was a thrilling day of racing at Whitetail Ridge. Thank you again to the St. Croix Composite Team and their volunteers who worked tirelessly weeks before the race to ensure the course and the infield were ready for the race. With the bye week schedule in place, the number of racers on the course is reduced from 1,500 to 700. In addition, with a different mix of teams at each race, students get to compete against different racers, and a variety of racers are on on the podiums. In the Middle School D1 competition, Stillwater and Prior Lake were once again battling for the first place finish. Prior Lake pulled ahead with top finishes from Jack Tocko and Alex Krawza to secure the first place trophy. Stillwater took second and Washburn held on for third place. Get ready to see which teams take the Middle School D1 podium in Race #6 on Sun. Oct. 14. Stillwater, Prior Lake and Washburn, who have taken the top honors the last few races, will all be on a bye week. In the D2 Middle School Team competition, New Prague Composite pulled ahead to take the first place trophy over St. Croix Composite by just six points; with Elk River Composite taking third place. In the High School Team Competition, Division 1: It was a close race for the top three spots, with Stillwater securing the first place trophy over Hopkins. Edina was close behind to take the third place trophy. Division 2: St. Croix Composite, on their home turf, beat out Mpls. South for first place in the team competition. Chaska took the 3rd place trophy. 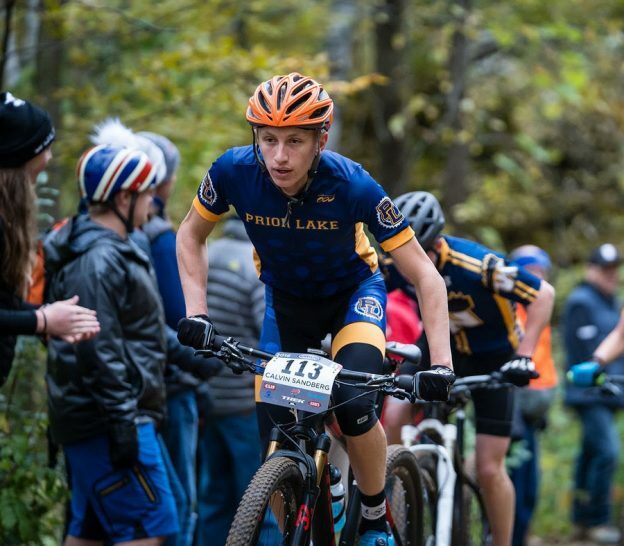 This entry was posted in News and tagged Minnesota High School Cycling League, MN High School Cycling League, Mountain Biking, National Interscholastic Cycling Association, NICA, River Falls WI, Western Wisconsin, Whitetail Ridge on October 12, 2018 by Russ Lowthian.